Around the time I started this journey I joined a gym, not my current gym but another. One where I knew a lot of people and one in walking distance to where we lived. I would seriously be lying if I said the main reason wasn't to take a shower. This is some real fracking truth there people! I had a 6 month old and two 2 year olds. Showers were NOT in the cards most days. So I gave it a try. I will never forget my first visit to the gym. I actually needed a double stroller and a front pack to get inside. Couple that with a gym bag and diaper bag and a 200 pound woman. While I KNOW that no one was actually laughing at me I CLEARLY turned heads and wanted to hide in the corner or turn around and walk out. I didn't do much while I was there because I was embarrassed. I didn't know how to use many of the machines nor was my mind ready to go all in anyways. I would often see some pretty tiny girls I went to high school with and I would walk to other way to not have to make conversation or see their pitty. I didn't last long at the gym, the showers I wanted oh so bad were again YES embarrassing. The towels they provided wouldn't wrap around me and the walk from the showers to the locker room was something I dreaded and would sometimes even get dressed partially in the shower just to avoid some of the embarrassment. Point I am trying to make is that everyone has to start somewhere. In order to walk in that gym I had to step out of my comfort zone. That was my somewhere, but it didn't click that time. I lasted about two months and was able to cancel my membership. This is where my walk that never ended began. Because I was so far out of my comfort zone I had to take a different approach. And I am happy with how it all came about. Those months and months of walking with my boys would come to be some of the very best times in my life. That was the first step to the many comfort zones I would begin to break out of. 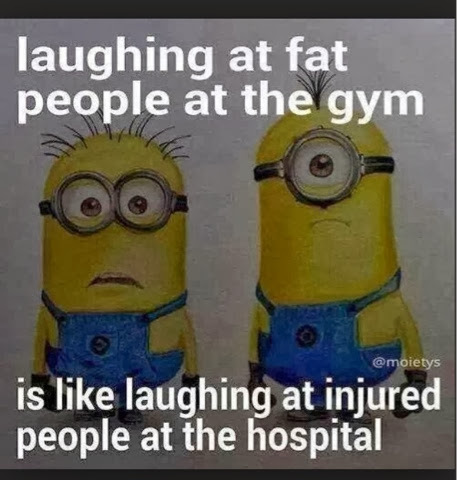 I know none of you would actually laugh at someone at the gym, but maybe we should smile at them. Don't stare or make them feel uncomfortable just smile because they broke out of their comfort zone to make that step to be there. #truth from the Mama on this Tuesday morning cuddling in bed with my three sleeping babies.